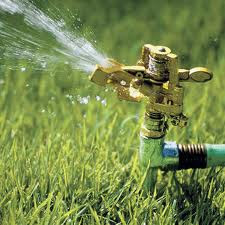 Have you heard landscapers or other people in the "know" throw around the term pulsating sprinklers? Some questions you might ask yourself are "What are Pulsating Sprinklers?" and, "Should I be using pulsating sprinklers for my lawn?" If you don't have or don't want to use an underground automatic sprinkler system, hose faucet watering is an excellent alternative. Hose faucet watering is done with a hose and one or several pulsating sprinklers. A very basic and broad definition of Pulsating Sprinklers is any sprinkler that is not underground and functions independently of other sprinklers. To give a better idea of the purpose of pulsating sprinklers, what they are, and how they work, let's identify the different types of pulsating sprinklers. 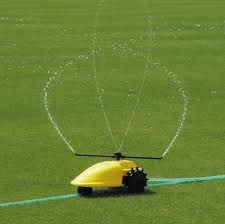 The first type of pulsating sprinklers is Stationary. Since "stationary" means not moving or not intended to be moved, a Stationary Pulsating Sprinkler either sits on a spike or spiked base. Because they are not intended to be manually moved or re positioned, Stationary Pulsating Sprinklers require high water pressure. Only cover an 85 foot diameter. This might be more than enough for some, but if you have a large lawn, you will probably have to buy multiple Stationary sprinklers in order to get all the coverage your lawn requires. 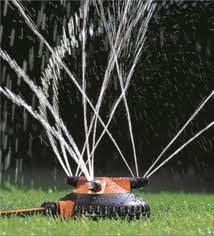 Probably the most common type of Pulsating Sprinklers are Oscillating Sprinklers. I'm sure you've seen them. They lay flat on the ground and shoot water high up in the air as the nozzles turn round and round. While most of the other Pulsating Sprinkler types literally pulse, the oscillating sprinklers disperse water at a more consistent and even-flowing rate of speed. The Oscillating sprinklers will shoot water high up into the sky, so overhanging decor, tree branches, and the like are at risk of getting wet. Impulse pulsating sprinklers are extremely efficient and versatile because they operate on low water pressure and discharge more water over larger areas than other sprinklers. Their spray is powerful and close to the ground which makes them wind resistant. If you have ever seen someone do "The Sprinkler" at a dance party, they're imitating an Impulse Pulsating Sprinkler because of the way the jig they do as they shimmy from side to side. Impulse Pulsating Sprinklers are almost always Stationary. The large orifice prevents clogging, unlike oscillator holes. After long periods of time, some impulse sprinklers have been known to rust. Technically, Rotary Pulsating Sprinklers can include some Impulse and Stationary Sprinklers but the most common rotary sprinklers have three arms and spin as the water pressure surges through. 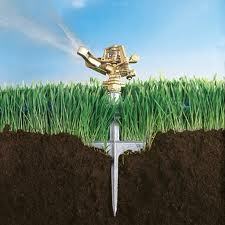 Basically, any sprinkler that allows for Full-Circle spray coverage is considered a Rotary Impulse Sprinkler. 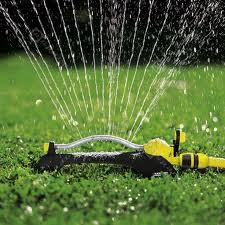 When using a garden hose for lawn watering, most people like to turn on their hose, set a sprinkler out in the middle of the lawn, and let the sprinkler water a section of the lawn for 15 minutes or so. Rotary sprinklers make that possible because they can cover a good amount of space before or without being moved or re positioned. Traveling Pulsating Sprinklers are self propelled devices that spray as they roll. Traveling as much as 200 feet, these sprinklers act as Rotary sprinklers except they move themselves so you don't have too. Some Traveling sprinklers are smarter than others, capable of being programmed to go certain distances, lengths, and speeds. I hope this helped you learn about the different types of pulsating sprinklers and to determine which, if any, is the best choice for you and your lawn.